Atherosclerosis is implicated in most heart attacks and strokes and is, in itself, a result of other causes, such as cholesterol, hypertension, diabetes, smoking and stress. Transcending turns out to have a significant positive effect on all these causes at the same time. If the cause is removed, it is no surprise if the effects also disappear. 2. This result is confirmed by research of high quality, in collaboration with the National Institutes of Health in the U.S. The National Institutes of Health (NIH) of the American Government is one of the most prestigious medical research institutions globally. The NIH has spent over $24 million in support of research on the effects of Transcendental Meditation. It has supported Transcendental Meditation research for over 20 years and, for two key reasons, the quality of the research and the effectiveness of the results. In medical circles, it had been considered very difficult to reverse atherosclerosis and and that reversal, if it is to happen, requires a drastic change of lifestyle as well as medication – the latter can also bring side-effects. However, two American NIH studies suggest that atherosclerosis can, in fact, be reversed in a fully natural manner, by reviving the healing intelligence of our own body. There are no associated adverse side-effects and even a good number of positive side-benefits, such as improved general health and well-being, increased intellectual capacity and improved relationships, etc. But, when they combined Transcendental Meditation with other methods of Maharishi Vedic Medication, the effects were even larger. A later NIH study randomly divided 57 test persons into 3 groups – a group learning TM while also taking a Maharishi Ayur Veda supplement by the name of “Amrit Kalash”, a group receiving health information on the importance of maintaining a healthy lifestyle, along with a vitamin supplement and a control group. All three groups were, moreover, further divided into sub-groups of normal healthy people and sub-groups showing increased risk for cardiovascular diseases. Researchers were unaware which individuals belonged to what group. After one year, there was no significant difference between the health-educated group and the control group. The control group even showed better results than the health-education group. Curing is great. Prevention is better. The biggest risk factors for arteriosclerosis are high blood pressure, smoking, insulin resistance (diabetes), cholesterol and chronic stress. 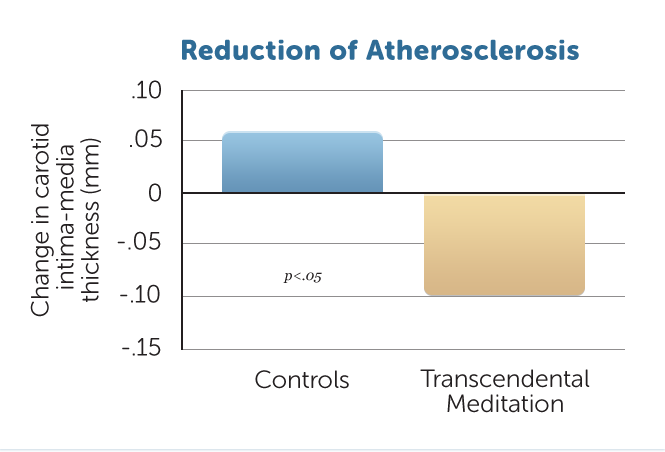 Research has shown improvement in each of these factors when research subjects had the regular experience of transcending through practice of the Transcendental Meditation technique. This suggests the value of Transcendental Meditation as a preventive tool. The NIH study has, amongst others, led to Dr. Mehmet Oz, cardiopathic surgeon and one of the world’s best known doctors famous doctor, fully supporting the Transcendental Meditation technique on his TV programme. In his presentation, Dr. Oz discusses the effect of TM on the 3 big risk factors for atherosclerosis: (1) high blood pressure, (2) high cholesterol and (3) diabetes.